As befits our reputation as the social club of the Distillers who happen to enjoy messing about in cars, the DCC was chosen to lead this event to Essex and Suffolk to visit the Mistress Distiller’s famous garden at Ulting Wick and the car collection of the Master’s friend Rupert Marks. 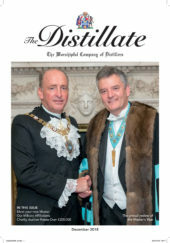 Both happened to be close to Constable Country, and as one thing leads to another, and we needed somewhere to stay, where better to go than the 5 star resort of Milsoms, dining at Le Talbooth, the pride and joy of Liveryman Paul Milsom, son of past master Gerald Milsom. The team, led by Bridget Stanley, did us proud with the delicious dinner and reception set alongside the river as the late summer evening gradually turned to dusk. What an amazing collection of top quality hotels he has. Earlier in the day we had wandered around Flatford Mill almost hidden in a charming if busy backwater with the famous views still discernable despite much growth over the years. The Stour valley is a delightful area if outstanding natural beauty in is this most picturesque of settings. It’s well worth the visit. The list of interests goes on – some of the group went off to view Leonie Marks jewellery workshop while others headed to the airstrip to carry out a regularity trial in a souped up Renault 4 of 70s vintage with the writer winning a pot of their honey, while being regaled with a master class on how to fly a gyrocopter! But then it was time to travel further south to Ulting Wick, where we were entertained by Philippa and Bryan Burrough proudly showing us the result of 23 years transforming a run down farm, yard and land to a magnificent 11 acre garden composed of many themed rooms and areas. Skilfully working around the 16th Century house, pantiled barns, small dwelling and outbuildings she has created a top-flight garden experience. We wandered round the white space and the pink room and the main other colour themed areas admiring the density of planting and the intense strong colours that are her trademark. Beyond the central areas were a wild pasture, a creek and wet area, and an arboretum planted from scratch and now tall and mature. 10,000 tulips are planted and removed each year together with many other delicate plants. No wonder this is a garden requiring full time attention especially as it lies in one of the driest areas of the country – you can imagine what means in the semi drought conditions we have experienced this year. A glorious traditional tea in the magnificent and ancient barn with delicious home made cakes brought the visit to a close with a vote of thanks to our generous hosts for inviting us into this very special place, and a cheque for the National Garden Scheme, which does so much to support the Macmillan nurses and similar needy organisations.